Sara Rachele made jaws drop last year with her heartrending EP, Madison County. If you haven't had a chance to listen to "Rebecca," do that, and then when you're done, come back here. Cool. 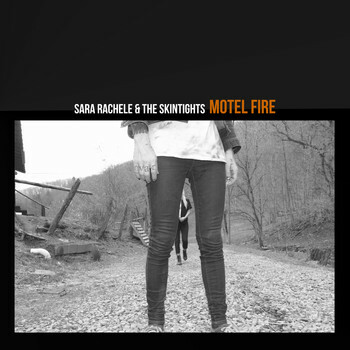 So in the intervening year, Rachele picked up two bandmates and has lightened things up significantly for Motel Fire. The press release reports that the band was "[i]nspired by the lyricists of Atlanta, Ga.’s vegan and queer community," which is something I can always get behind. Rachele combines her otherworldly vocals and hard-learned lessons with wWaylon's Stooges-like drumming and Gyasi Heus' rockabilly licks. While songs like "Motel Fire," a literate stunner by Atlanta-area Will Dollinger, play to Rachele's established strengths as a torch singer. But rockabilly dance numbers like "Bingo Bango" showcase the band's expertise and obvious enchantment with each other. It's their party; we just get to attend the Skintights' twisted sock-hop. Overall, Motel Fire, is a far-ranging romp through the last fifty years of Southern American music, and it sounds amazing. I sincerely hope this isn't a one-off; this is an album for the highs and lows and is one of my favorites so far this year.